It was a bright Saturday in January, and I had left the centre of Norwich to follow a weaving path out through the north-eastern suburbia, visiting churches of various denominations with varying degrees of sucess. By midday I had reached the outer limits, the very edge of the city. I turned off of Sprowston Road along the promisingly named Church Lane, and after doglegging a bit around the new road system I found myself cycling up the side of a playing field towards the splendour of a fine 18th Century red brick tower, which lifted its handsome face above the modern housing and the fields beyond. This big church, the parish church of what is nowadays Norwich's most populous suburb, was a beautiful sight in the sunshine. It appears much bigger than it actually is, partly because of the way that the clerestory runs continually all the way to the east end of the chancel, even though the aisles stop short. It gives the illusion that the chancel might be two-storey inside, which it obviously isn't. The graveyard is well-kept, but interesting too for its older stones. To the north of the church I could see the new burial ground, and local people in the sunshine tending the graves of their loved ones. It was all very pleasing - you really felt that they still saw this old place as the heart of their community. I had been led to expect that I would find St Mary and St Margaret open, and so I was at first a little disappointed when the noticeboard told me that Regretfully this church is kept locked, especially as the key at the Rectory was way back at St Cuthbert. But then I saw another notice above it saying that The Church is Open Daily, which was much more encouraging. It turned out that the noticeboard is about to be replaced, and all that is necessary is the awaited planning permission. Looking across at the porch, I could see that the outer door was indeed wedged open, and so I trotted across enthusiastically. As I walked, I looked again at that imposing south side. It seems that much of it was remodelled during the 1880s restoration at the hands of Edward Boardman, an architect more often associated with banks than churches. I opened the inner door, and stepped down inside. Well. 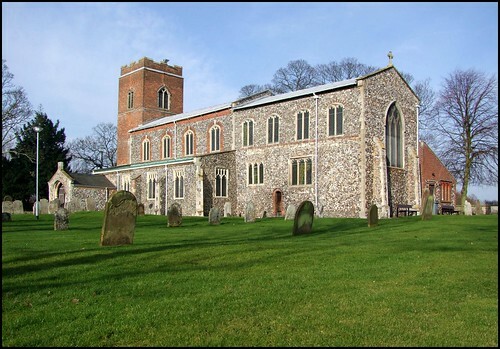 all I can say is that this church is one of the most welcoming that I have visited in all Norfolk. Everything is intended to extend a hand of friendship, and this is epitomised by the open door into the kitchen and lavatory extension, and a sign saying Dear visitor; you are welcome to make a drink in the annexe kitchen. I thought that was excellent, a model of what a church should offer, if it can, to pilgrims and strangers. Boardman's restoration was not carried out with a light touch, but in any case the church had been considerably restored in the early 18th Century when the tower was rebuilt. The big, clear windows of the south and north sides of the nave fill it with a honeyed light, and the sheer height of the nave and chancel creates a dramatic effect, not lessened by the way the steps to the sanctuary lead up towards Boardman's good east window with its glass by Heaton, Butler & Bayne. The church is big enough not to be dominated by its most significant survivals, which are fine group of memorials to members of the Adams, Corbets and Knoles familes in the north aisle and chancel. As at Old Catton a couple of miles off, they are reminders of the power and importance of the big familes on the edge of what was still England's third largest city until well into the early modern period. Most moving are the figures of grief standing either side of the memorial to Thomas Adams and his wife. Adams, who died in the early years of the Restoration, had been Lord Mayor of London before the Commonwealth. The weeping putti rather put the characterless reclining figures of Adams and his wife in the shade. More alarming are the figures of Thomas Corbet and his wife, like coloured dummies who have escaped from Madame Tussaud's, and are now lying low in the country. Thomas Adams bought the Sprowston estate from Thomas Corbet's son in 1645, thus transferring it from one dynasty to another. I have already mentioned the Heaton, Butler & Bayne glass in the east window, which depicts the Acts of Mercy - the same subject can be found a short distance across the suburbs at Old Catton, so must have been much in the mind of late 19th Century north Norvicians. Also very good are Jones & Willis's figures of Justice and Mercy in the south aisle, full of early 20th Century piety and triumph. From later in that century is the delightful memorial window to Dorothy Mary Furze, also in the south aisle. It depicts the symbol of St Dorothy and the figure of St Mary Magdalene, and I think it must be the work of the King workshop. I visit a lot of churches, as you may imagine, and there are some places where you get a sense of the marginalisation of organised religion in general, and of the Church of England in particular. Nothing could be further from the truth at St Mary and St Margaret. The welcome for visitors, the war memorial, the various banners, the family history records at the back of the church, all of these things contribute to the feel of a place which is at the heart of its community, and a touchstone. It delighted me that the people I had seen outside laying flowers on graves could, if they wanted to, combine their visit with a prayer said in a church. Where a church is kept locked, this is not possible, and grave-tending becomes a pagan act, divorced from the reality that the Church is there to minister to both the grief of the living and the journey of the dead. Because of open, welcoming churches like St Mary and St Margaret, this will not be forgotten in Sprowston as easily as it might be in some places.